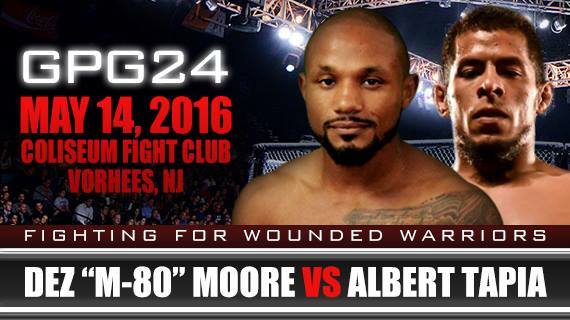 Des Moore is coming off his only professional loss and that was up a weight class in a five-round battle against a much larger Andrew Czeh. An American Top Team member, Moore has moved down to Florida to train full time and is back fighting close to his old stomping grounds in Pennsylvania. Back in his preferred weight class, he takes on a very ready, Albert Tapia. Tapia loves training full time as he spends most of his days in the UFC Gym. Both fighters are cardio machines. This could be five-rounds of nonstop action. Burrell is a Philly born and bred fighter. The Rock-n-Rolla has fought in the UFC and Bellator. He has a huge heart and brings the fight to anyone who stands before him. His last time in the cage at GPG 23, he battered Canadian, Ryan Dickson and took home the belt with a barrage of combinations. His fans will be in attendance, and they will be loud! Dustin Long brings in a nice 6-2 record with four submissions. He is a veteran on TUF. Dustin knows he will be in hostile territory but has no fear and is coming for the belt! Ruslan Melikov vs. Timothy Woods – 185 lbs. Melikov is 3-1 and looking for a big finish. His K-Dojo team is very tough and talented. He goes head to head against a very well trained Tim Woods (7-4). Woods trains with Team Lloyd Irvin and gets to put himself to the test against UFC level talent on a daily basis. Tremendous fight brewing, here. Darren Mima 7-4 vs. Juan Puerta 11-4 at 125 lbs. This is shaping up to be a grudge match as Puerta took this fight on three weeks notice and has said that he wanted this fight and was going to get the win. He had some harsh words for his opponent. Mima is a very powerful fighter and is always in excellent shape. He has aspirations of making it to the UFC so he cannot afford a loss against Puerta who also believes that is where he belongs.